We offer a complete line of document services to meet your specific needs, from copying and printing to document scanning, wide format imaging, even vinyl banners and signs. Explore the array of services that we provide on our “Services” page. Our store hours are Monday through Friday, 9:00 a.m. to 11:00 a.m. and 1:00 p.m. to 4:00 p.m. (Appointments and order pickup times may also be requested within the hours of Monday through Friday, 8:00 a.m. to 5:00 p.m.). 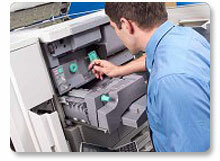 Snappy Copy Center is also a sales and service provider for Canon, Sharp, Xerox and HP copiers and printers. From basic printers to multi-function copiers that can copy, print, fax, and scan, Snappy Copy Center can provide both brand new and used products to meet your business needs. Our factory trained techs can service everything we sell and provide network and PC support for the systems as well.